I need to figure out what to do with all this corn. 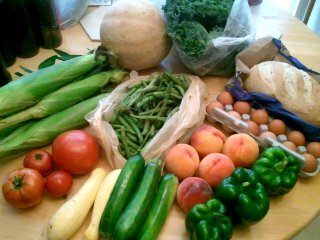 Week 10 of the CSA: six ears of corn, cantaloupe, kale, green beans, tomatoes, summer squash, peaches, green peppers, and the usual eggs and bread (Great Harvest sourdough). I was pleased to find a vein of parmesan running through the sourdough when I cut it in half. A good summer way to eat green beans: trim them (cut or pinch off the stem end), blanch them (cook them in boiling water and then plunge them into ice water to keep the crunch and the bright green color), and then toss them with sesame oil, ponzu sauce, garlic powder, and fresh ground pepper. If you don’t have ponzu, use soy sauce and a squeeze of citrus. Serve alongside, well, anything. Leftovers are also great straight out of the fridge. Week 11 of the CSA: double corn! (I traded one eggplant for six ears of corn. I don’t usually avail myself of the trade table, but this seemed like too good a deal to pass up.) 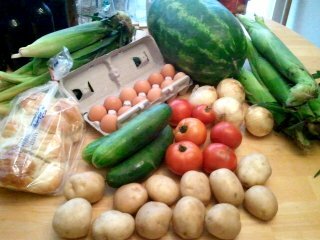 So: twelve ears of corn, a giant sangria watermelon, onions, tomatoes, cucumbers, white potatoes, and the usual eggs and bread (Great Harvest challah). The sangria watermelon is fantastic. Its flesh is dark red, intensely sweet, and incredibly juicy. I cut it up that very night and promptly proceeded to eat so much of it that my stomach felt physically swollen. I also had a grand time spitting seeds into a bowl. I don’t know why, but a lot of the watermelon in stores these days is seedless, and it makes me sad. I think the best, sweetest bits of the watermelon are nestled softly around the seeds. Besides, one of my favorite memories of summer as a kid was the experience of sitting outside, munching watermelon, and spitting seeds into the grass on a twilight evening. I hope to recreate that experience for my kid one day. This entry was posted in CSA, weeknight cooking by kat. Bookmark the permalink.